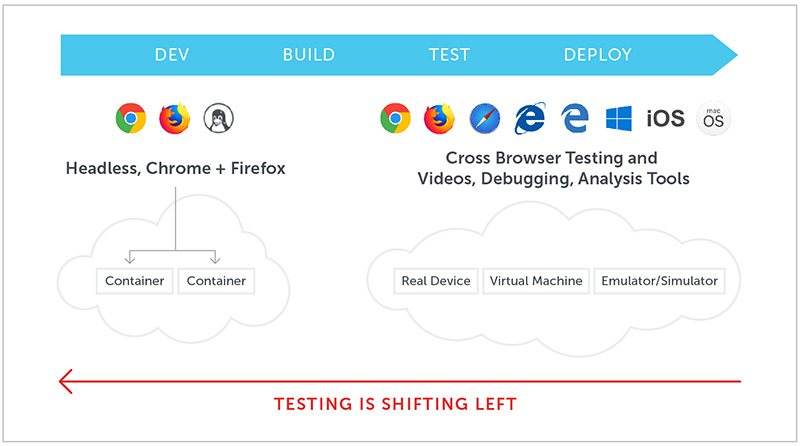 Sauce Headless offers a solution for teams that want to accelerate their efforts to shift testing left. As developers execute more tests earlier in the pipeline, Sauce Headless allows them a cost-effective way to spin up headless Chrome and Firefox browsers to get instant feedback on the quality of their code. Meant as a complement to traditional Sauce VMs (which you would still use near the end of the development pipeline for their comprehensive coverage and debugging capabilities), Sauce Headless provides a tool for teams that need simple pass/fail data on these early pipeline tests, all while running them 50% faster. Sauce Headless is the first solution of its kind in the market, and we are currently looking for current Sauce Labs customers who would be willing to try it out and provide in-depth feedback before its release in Spring, 2019. This free, open beta is available to all of our customers currently on a contract enterprise Sauce Labs account. If you would like to be considered for the Sauce Headless beta, please fill out the form on this page to be put on the interest list. We will reach out to you once the product is ready for testing. If you are not a current Sauce Labs contract customers, we invite you to fill out the form, and we will keep you updated once the Sauce Headless has been released. Want to learn more about Sauce Headless? Check out some of our resources on the benefits of headless testing, and how Sauce Headless can accelerate your testing to speeds you have only dreamed of.